Hello, dear readers. If you don't know me in IRL, you may not know about the ridiculous-ness going on in my life right now. Ridiculous-ness tends to be time consuming, so my apologies for being absent from the blog-o-sphere recently. In my very little free time I've been training for the Cleveland Marathon, fighting with Target and Value City Furniture, and embracing my motto for 2010 ("why the heck not") by going out and about more often. These things also cut into blog writing time. But I thought I'd share the story of my dining experience at Paladar last night. I'm a discount gift certificate junkie (hello, $50 certificates for $25) and try to pick up certificates for restaurants I really like or restaurants I've never/hardly ever gone to because of price. (what are the kids calling the state of the economy these days? depression 2.0? it doesn't hurt to be thrifty) So when I was able to get a discounted gift certificate for Paladar a few weeks ago, I was really excited to get the opportunity to go to this restaurant with my friend Heather, who's nice/adventurous enough to humor me by going to random restaurants all around town. I'd been to Paladar over a year ago, but to be honest, all I remembered were my drinks, so I was excited to get to try the food again. Since Paladar is a Latin rum bar, with a hip and trendy feel, I felt like I needed to get one of their house specials...ironically, not made with rum. 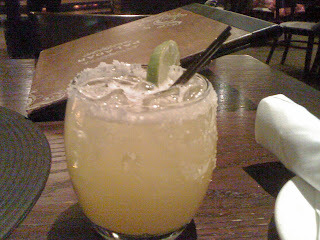 I love me some margaritas, so I got the mango "traditional" (read: cheaper) margarita. Was it especially mango-y? No. Was it especially strong? No. But it was still pretty good. Maybe I'm just so used to having margaritas that take like pure tequila that I wasn't expecting a margarita that actually sort of tasted like citrus. Heather and I are big guacamole fans, so we ordered the house guacamole and chips and salsa. We wolfed that down before I even thought to take a picture. Unlike the traditional corn chips served with salsa and guac, Paladar serves "regular" tortilla chips along with yucca and plantain chips. The salsa is unique, too. We were served two varieties - pineapple and black bean and fire roasted tomato and jalapeno. I have to say that our portions were a bit small. Especially for the guac. I think we were served half of an avocado, which was too bad because the guacamole was SO good. I was also a fan of the roasted tomato salsa, so I helped to make a dent in that after the guac disappeared. 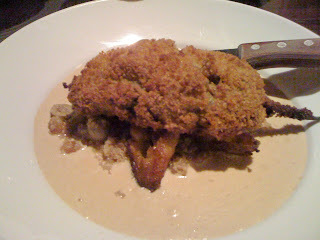 For my entree, I got what might be the only vegetarian entree on the menu - the panko crusted vegetable relleno. Latin food isn't really known for being vegetarian friendly, so I wasn't all that upset. This moderately spicy poblano pepper was stuffed with vegan pinto beans and quinoa, served on top of the most delicious plantain I've ever eaten. To add additional flavor, the dish was sitting in a "lick your plate good" corn and raisin sauce. I'd definitely recommend Paladar if you're looking for a night out to enjoy some beverages or if you're in the mood for Latin food. They seemed pretty accommodating, so I'd imagine they could make an entirely vegan dish, if you're into that sort of thing.